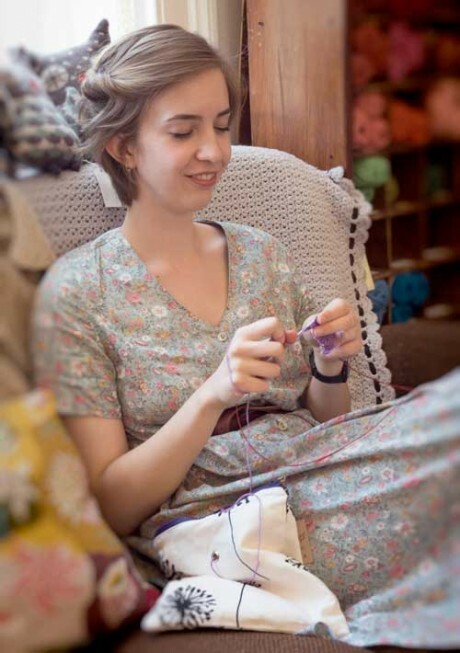 Finally we are getting a bit of nice, light, summer knitting weather! Yeah! Later in this post, we have a tutorial for the figure of eight cast-on, mentioned in other tutorials (and here) and a new way of striping those toe-up afterthought heel socks. 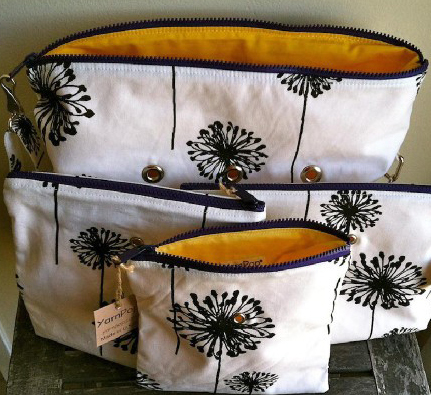 But first we wanted to show you the new knitting bags we got in at Loop. Above you can see Sophie knitting with one of the Yarn Pop Gadgety bags. 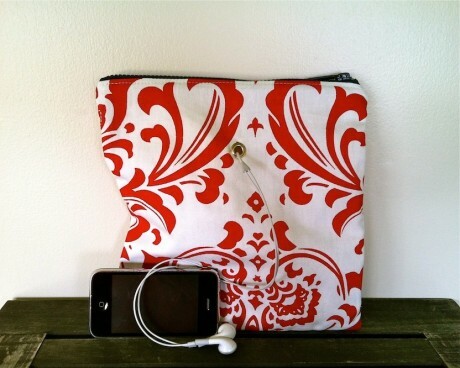 These are great because they have grommets that allow yarn to be threaded through. The ball of yarn stays safely inside the bag pocket, instead of rolling out and across a crowded, moving bus. No more crawling around on the floor of a sticky, double-decker, looking for my lost balls. I’m not the only one that’s happened to, right? 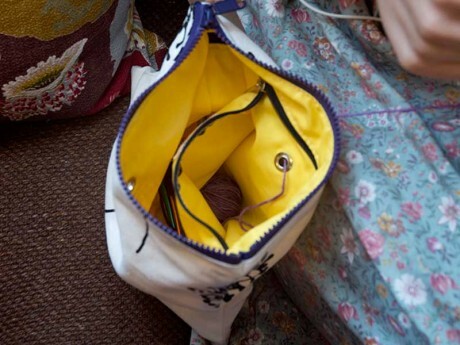 The little pocket inside the bag holds Sophie’s yarn ball , while the grommet feeds it through to the knitting. They are also great for feeding your headphones through. The wires can stay in one pocket, safely away from their favourite hobby of tangling with my yarns! These bags make the Loopettes very happy! I’ve added a new striping pattern to the mix. I’ll still have my toes and heels in the taupe Lang Jawoll, but this one has eight rows of the Tosh sock in Fig, two rows of the Lang Jawoll, and another eight rows of Tosh sock in Saffron. I think he’ll be good friends with the other socks! 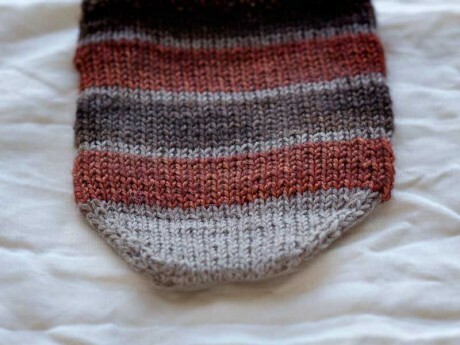 I used a figure of eight cast on to begin these socks in the round, with no seam. this is a handy cast-on for all kinds of projects so here is a quick tutorial of it. 1. 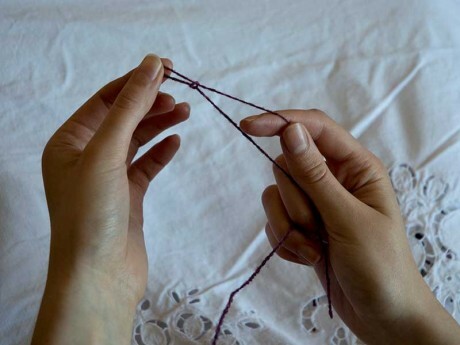 Make a slip knot and place it on the needle. 2. 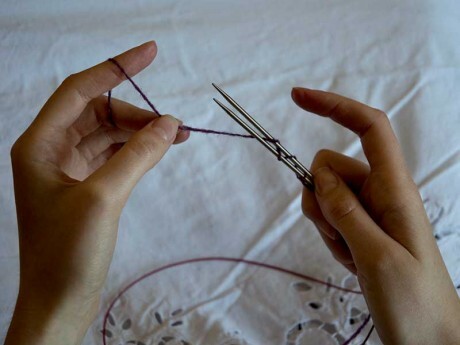 Hold both ends of the circular needles together and wrap yarn around the needles in a figure of eight pattern. 3. 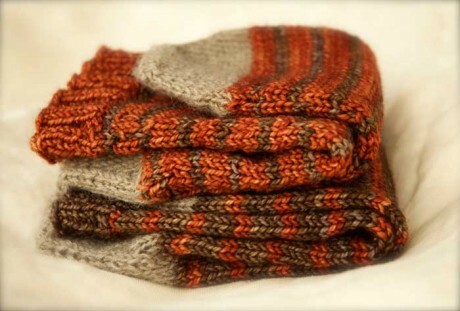 The needles should hold an equal number of wraps, totalling the required number of stitches. 4. 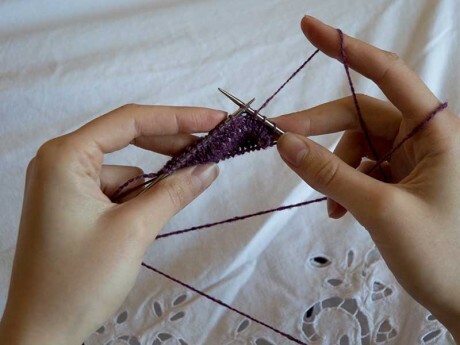 Begin knitting in to the loops from one of the needles. 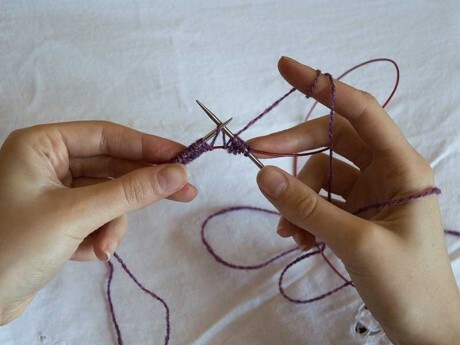 Be careful not to twist the stitches as you knit. 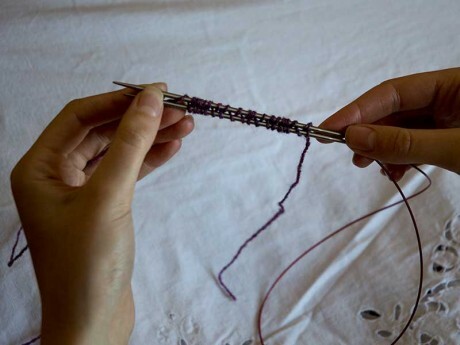 When you finish the loops on the first half of needles, reposition your magic loop and knit through the loops on the other half of the needles. 5. Continue knitting in the round. There is no join at the beginning. Easy! Check out this video above! do you prefer this to judy’s magic cast-on?it looks a lot less fiddly….! I find this cast-on to be very uneven and difficult to work the first row. This is a simple and better beginning than Judy’s start. Thank you for sharing it!